Packed with vegetables and creamy peanut butter as the base, this stew warrants a place in the rotation. 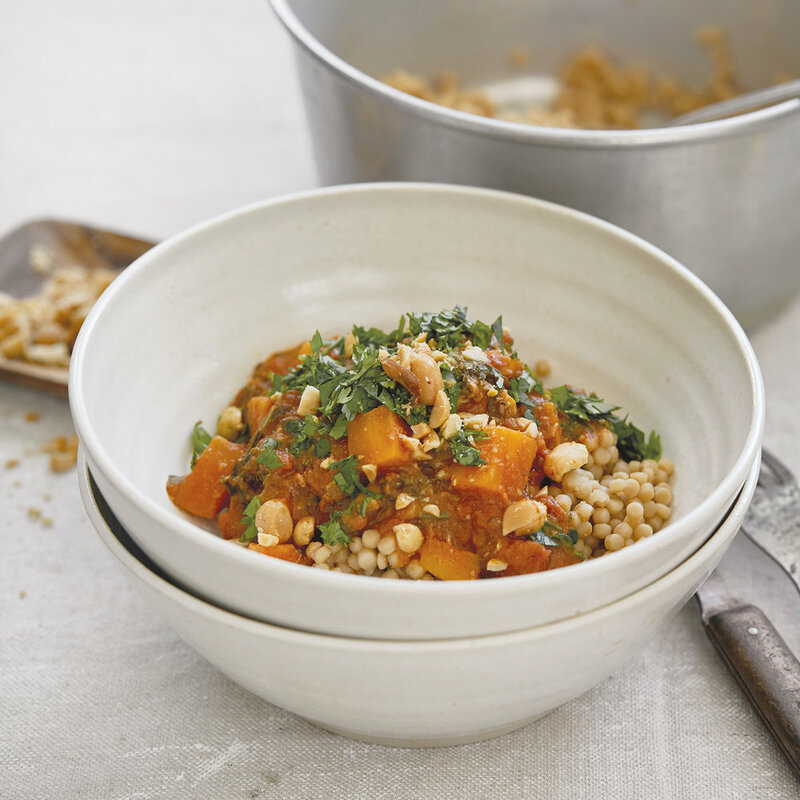 We love it with whole-wheat Israeli couscous but also try it over chickpeas or brown rice. In a medium Dutch oven, heat oil over medium heat. Add onions and cook for about 10 minutes, until softened. Season with salt and pepper. Add garlic, ginger, cumin, coriander, and cinnamon and cook for another minute. Add sweet potato and stir to combine. Add about 1/4 cup stock and deglaze pan, scraping up browned bits from bottom. Add another 13/4 cups stock and tomatoes. Cover and cook until sweet potatoes are tender, 20-25 minutes. Meanwhile, make couscous. In a medium saucepan, bring remaining 2 cups stock to a boil. Add couscous, cover, and simmer, stirring occasionally for 8-10 minutes until couscous is cooked and liquid has evaporated. Fluff with a fork. Add kale to pot of stew and stir in peanut butter. Simmer for another 10 minutes, until kale is wilted and tender. Add a bit of water if sauce is too thick. Divide couscous and stew among bowls. Garnish with cilantro, peanuts, and hot sauce (if using) and serve warm.